Pictured with our 8" Beeswax Taper Candle, sold separately. 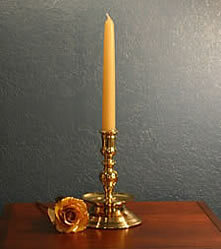 This lovely heirloom quality candlestick in solid brass measures 7" high X 3-3/4" base and would do Mr. Hogge proud. The drip protector made this design a favorite in drafty areas and since it carries most of its weight in the base it is almost impossible to tip over. The Swedish ship Wasa sunk on its maiden voyage in 1628. When it was salvaged a candlestick much like this one was found in the Captains cabin. The first cast-iron cannon made in England came from Buxted in Sussex, and was made by one Ralph Hogge. We do not claim any direct connection between Mr. Hogge's cannon and this lovely candlestick, but Sussex does obviously have a long and rich history of casting metal.